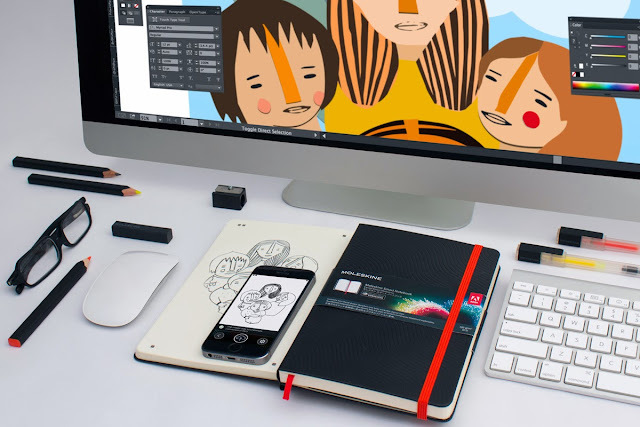 "Moleskine's latest collaboration happens to be with Adobe, and the resulting Moleskine Smart Notebook and accompanying Creative Cloud app make it easy to turn work on paper—made with any implement of choice—into JPG and SVG files for use in Illustrator and Photoshop." "On Spotify, music consumption is “frictionless”—a favorite word of Ek’s. In tech terms, we’ve gone from a world of scarcity to one of abundance. Nothing is for sale, because everything is available. The kind of calculations you make on iTunes, such as “I like this song, but not enough to buy it,” don’t matter. It is a music nerd’s dream, which may be why the user population on Spotify tends to lie outside the mainstream. On Spotify, the Pixies’ top songs have about four times as many streams as Neil Diamond’s biggest hits." "Recent survey data from Cambridge Sound Management revealed the impact of noise on productivity, which will likely come as no surprise to those of us working in open offices. The survey revealed nearly 30% of office workers are distracted by coworkers’ conversations." "This is why the Taylor Swift affair is a genuinely dangerous moment for Spotify, which is used to artists including Adele, Coldplay and Beyoncé “windowing” their new albums: keeping them off streaming services for a few months after release to maximise sales of CDs and downloads. By removing her entire back catalogue, Swift has generated a new discussion about whether albums should also be windowed between the free and premium tiers of services like Spotify. Her music remains available on premium-only rivals like Rdio, Napster and Apple-owned Beats Music." "And so as it came time to prepare for the annual Free Floating Christmas compilation, all|is|calm, I thought that I would end this “In Hindsight” year with silence. No new music. No bustle of collecting new tracks and auditioning them. No designing artwork." "Throughout the day, we face a number of decision points about how to spend time. Too often we approach these decisions passively, as if our hand were being forced, our free will compromised. Let me add one caveat: if you have young children, a brutal commute or juggle several jobs to make ends meet, you are exempt from everything I write in this piece. You are truly busy." "Shazam searches are just one of several new types of data guiding the pop-music business. Concert promoters study Spotify listens to route tours through towns with the most fans, and some artists look for patterns in Pandora streaming to figure out which songs to play at each stop on a tour. In fact, all of our searching, streaming, downloading, and sharing is being used to answer the question the music industry has been asking for a century: What do people want to hear next?" "There's a real reason why there's a vinyl renaissance," John Vanderslice said. "There's a lot of people who are having an amazing listening experience. It's not false." "Meghan Trainor's "All About That Bass" video, posted to YouTube in June, is nearing 300 million views. So, what did the singer do for an encore to her No. 1 hit? She got a brand, an ad agency and social influencers involved." "After spending over 62 total hours comparing turntables and measuring their performance using $30,000+ worth of equipment, we’ve determined that the Audio Technica AT-LP120-USB is the best turntable for most people. It is highly adjustable, has a built-in phono preamp for hassle-free setup, sounds great out of the box, and even has a built-in USB port if you want to digitize your LP collection. It’s also very speed accurate, according to our tests."